Vitamins A and E enrich this hand cream based on Dead Sea minerals that not only moisturizes skin but also strengthens fingernails. Give your hands a soothing treat! 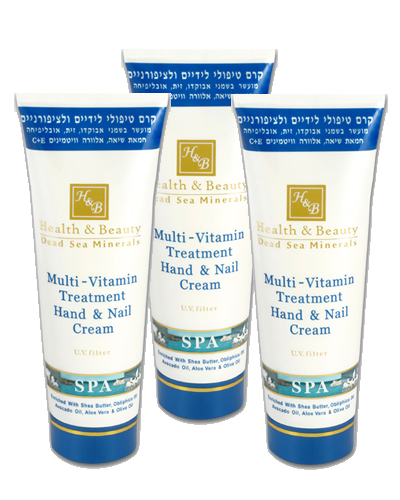 Created by Health and Beauty Dead Sea Minerals this professional intensive treatment hand and nail cream repairs damage caused to your hands every day. Nourishing Dead Sea minerals soften and smooth the skin, while antioxidant Vitamins A and E enrich the skin and finger nail beds. Chamomile, Olive Oil, and Aloe Vera extracts provide additional benefits and moisturizing action. This rich hand and nail cream also contains tea tree oil to treat fingernail fungus. Keep a tube of this multi-vitamin hand cream in your bag, at your bedside, and in the kitchen. Use: Massage into hands and nails as needed. Sodium Palmate, Sodium Palm Karnelate, Aqua (Water), Maris Limus (Dead Sea Mud), Maris Sal (Dead Sea Salt), Hamamelis Virginiana (Witch Hazel)Water, Sodium Chloride, Glycerin ,Tetrasodium Etidronate, Tetrasodium EDTA.